Characterised by dark forest, medieval villages, and gothic castles, Romania is a mesmerising destination; with seven UNESCO-listed monuments, magnificent landscapes, as well as a vivid culture, visiting Romania is truly an adventure. The country has slowly emerged from the effects of repression under communism, and is rapidly regaining its identity as a popular tourist destination with plenty to offer the international traveller. 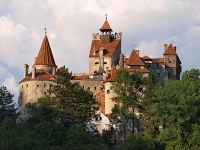 Exploring Romania is certainly rewarding, with the names of attractions alone evoking a certain charm - who could resist finding out more about mysterious Transylvania, the literary home of mythical monsters. The country's geography is diverse: from mountains, rolling hills, and rural farmlands to white sandy beaches and resorts along the Black Sea Coast. Dotting the natural landscape are rustic villages where local people live much as they have done for the past 100 years. There is an abundance of religious architecture - including the exquisitely painted monasteries of Bucovina - with ancient churches and cities bursting with history. The capital city, Bucharest, is re-inventing itself, its damaged architecture slowly being restored to its original glory. It has elegant restaurants, a revitalised nightlife, and cultural attractions that are becoming integral to its new image. The mix of quaint medieval towns and castles, drab cities striving for Western modernism, and the diverse rural landscape seemingly untouched by modern history, offers a fascinating kaleidoscope. Romania appeals to visitors because it is so unique: it has one foot firmly placed in the past, while the other is stretching forward in an effort to keep up with the progress of the modern world.